I'll tell you a secret: I'm allergic to gratitude. If you’ve spent any time in the self-help world at all, you’ve probably heard about the benefits of keeping a gratitude journal. This practice does nothing for me. I understand why it might be useful for some people, but I don’t love it. I've spent so much time telling myself "You should be grateful for [x]" that the word itself brings up feelings of irritation, resentment, and guilt. If you look up gratitude in a thesaurus, you get synonyms like indebtedness, obligation, and requital. Ugh. No thanks. I'm done with trying to force myself to feel a certain way. However: humans are wired to give more weight to negative events. It makes sense to somehow emphasize the positive ones and balance out your worldview. And there is a lot of evidence out there that a (ugh) gratitude practice has a meaningful effect on your life. So how can we do this without it feeling fake, forced, or obligatory? If you hate the g-word as much as I do, how do you feel about appreciation? While one of the definitions of appreciation is gratitude, another is recognition of worth. This feels so much more empowering to me. It's a choice I've made to recognize the worth in the world around me. A gratitude journal may make me want to gag, but an appreciation journal feels a little more doable. This exercise comes from Martin Seligman, the “father of positive psychology.” According to him, three weeks of doing this had a positive emotional effect on test subjects up to six months later. At the end of your day, simply note down three things that went well. In his version, you can also add why you think they went well. The language of “what went well” accomplishes three things: it takes the gratitude label out of the equation, leaving you free to feel appreciation, satisfaction, relief, or a spectrum of other positive emotions. Secondly, doing this exercise helped me realize that the majority of events in my day happen without a hitch. I got better at putting the occasional glitch in perspective. Thirdly, it gave me a body of data to look back at and see what I thought was worthy of labeling as “going well.” I frequently mentioned time with friends, time spent creating, and time outdoors. Sometimes I’d list a memorable meal or a workout. Something like binge-watching Steven Universe, while technically going the way it was supposed to, didn’t make the list. This gave me some great insight as to where I’d like to put more of my time and energy. 3. What do you want to remember? This was inspired by a Seth Godin article. So many things happen to us throughout the day, most of them forgotten by the next. Unless we do something to tell our brains “This is important,” it tends to get lost in the shuffle. We already do this automatically with painful, stressful, or embarrassing things because we’d like to be able to avoid those kinds of situations in the future. But what about the sublime, the cozy, the just-right? What happened today that you’d like to remember five years from now? 4. Noticing what you’d like to continue happening. For one day, make a mental note of everything that happens to you that you would like to keep happening in the future. This can be anything you can perceive with one of your senses. This exercise comes from Solution-Focused Brief Therapy. When I do this, I find it easier to stay in the present and appreciate life's small pleasures. Don’t worry about sticking with it indefinitely. 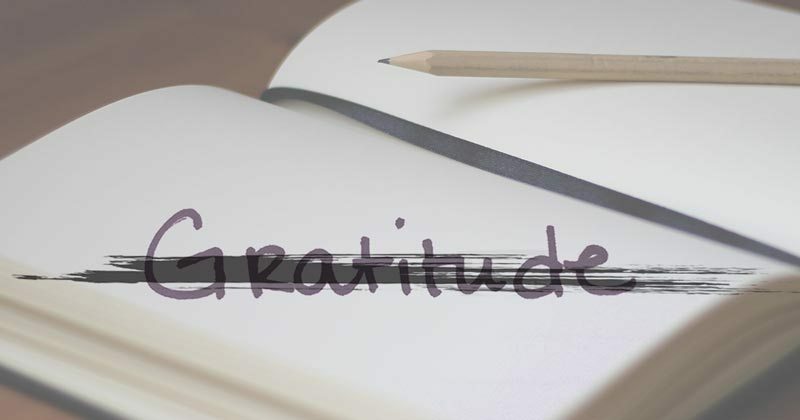 A lot of gratitude journal proponents will tell you that you need to do this every day. I agree - up to a point. Like any routine, it’s meant to support you. When you don’t need it, you can let it go. It will always be a part of your toolbox, after all. Start with committing to one of these exercises for 1-3 weeks. As Martin Seligman showed, even this brief amount of time can have positive repercussions far into the future. The gratitude journallers will tell you that you need to physically document your list. In the case of the "what went well" and "what do you want to remember" exercises, I think that a written record is helpful for the reasons I mentioned above. The last is more of a mindfulness practice and doesn't require the same level of documentation, since you're looking for many small moments throughout the day. If you have a smartphone, keeping a record is incredibly easy. Set an alarm for the evening and when it goes off, use your favorite note-taking app to list three things that went well or that you want to remember from the day. That’s it - the whole thing might take you five minutes. Of course, you could use a physical notebook or a voice-recording app if that's more your style. I’d love to hear about your experience with these exercises or your own favorite gratitude journal alternatives. Newer PostHire a Career Coach if You're Serious About Leaving Your Job.